Re: EEVblog #1186 - Solus Graphene Heater Kickstarter BUSTED! Here's a happy customer taking advantage of its >95% electricity saving and powering it using batteries. Good luck with that. Interesting that the "creator", currently calling himself "Maxim Interbrick" is so clueless about voltage. Well at least he's not saying volts per hour! I can't see how they'll work from 48V to 220V without using any heat wasting electronics. This stinks of the Batteriser campaign. It doesn't matter how many times they say "the graphene continues to generate heat" and "we have a video that proves it", it doesn't make it true. Facts are facts, whether or not they are convenient to "Max" of Solus. They finally mention BTU's and 100% efficiency! Maybe KS are going to take some action? Doesn't mean it's cancelled, I suspect they are going to ask Solus to prove their claims. This is now tricky business because it possibly puts some sort of legal liability on Kickstarter if they suspend it, evaluate the claims, and then reinstate it? 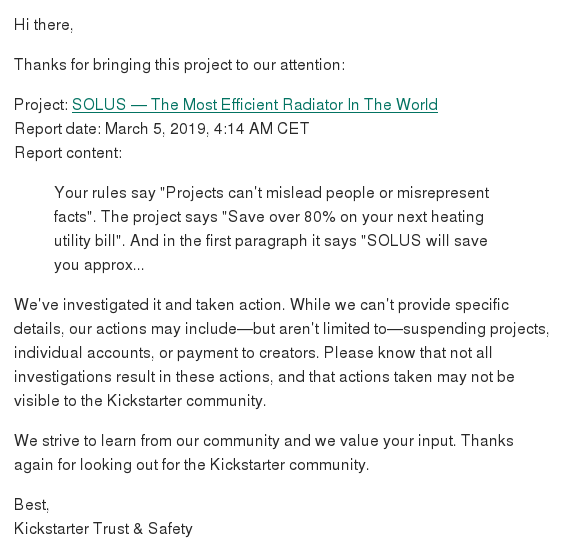 I suspect Solus will simply realise their chances of succeeding with this scam is slim to none and will cleanse their campaign and remove references to "most efficient radiator in the world" and all mentions of graphene generating heat after power is disconnected. They will go on to sell a sub-standard space heater with a trendy design, pocket as much cash as they can in the process and move on to the next scam. Kickstarter did not contact Solus before suspending it it seems. I actually don't agree with that, and explanatory email should have been sent before or at the same time. But it seems this all just happened minutes ago and I just happened to check shortly after someone posted that tweet. Someone says their pledge was cancelled, so maybe KS have actually cancelled it? I'm wouldn't be so sure. Many people who run these kinds of things do genuinely believe in what they are doing actually works. I honestly can't believe some people can be that stupid and deluded... but then again... Scientology is a thing. Electric radiant heaters are all over the place, as a simple search will demonstrate. Even the concept of using graphene is not new, as I showed in my video, a company was previous shut down by the government for exactly the same product and claims. Hmm, you sign up for the mailing list and they have their address in Leeds UK. This guy is the head of strategy at Koleda and is based in Leeds, so that makes sense. I haven't been following all of the recent events but I honestly believe that some of these clown funding organisations deserve a good kick in the arse, their lack of filtering and monitoring gives the entire process a bad name and hinders good products and reputable campaigns. I expect them to eventually use an excuse like "We don't want to stifle true innovation", and of course the classic "they laughed at the Wright brothers" line. Maybe not having someone on staff with the knowledge to make a call on technical stuff like this is a deliberate move? Looks like if enough people complain [and you make a video about it...], Kickstarter will put a stop to it. They cannot avoid legal responsibility if they knowingly permit fraudulent activity on their site that they benefit from. This certainly seems like an oddball group. This Maxim guy who is a media networking promotions blah blah guy, another marketing/strategy guy in the UK, and who else? I did find photos, and they appear to show the same guy - there does appear to be only one Maxim Interbrick. There were some more personal links, which I didn't include (easy enough to find, though) - he seems to be a real person. Maybe they have some threshold, like ignore less than 10 reports and only then take a look at the project. Likely, unless it's absolutely obvious to the non-technical Joe Average they have working in the trust and safety review team. And you can't expect a Joe Average with no engineering experience to evaluate something like this, because on the surface it seems like a genuine campaign, with genuine responses to questions and genuine tests etc. It's only upon inspection of the finer technical details of the claims does this fall apart. They should make enough money by now to hire one or more good engineers to review the problem cases. It would be useful for their reputation. That won't be getting un-suspended. There's a least one in the comments who still wants one.